One of the largest and most important groups of dung beetles in the world evolved from a single common ancestor and relationships among the various lineages are now known, according to new research by an entomologist from Western Kentucky University. The study by Dr T. Keith Philips, recently published in the open access journal ZooKeys, provides important insights into the evolution and diversity of these dung beetles, which make up about half of the world’s dung beetle fauna. The two tribes studied, the onthophagines and oniticellines, evolved from a single common ancestor and are found worldwide, except for Antarctica. These dung beetles make up the vast majority of species and dung beetle biomass in many ecosystems, feeding on mammal dung. Dung beetles are well known to many people because many species are colorful and active in the daytime. Additionally, many taxa have unusual behaviors, such as making and rolling balls of dung away from a dung pile. Often thought of as nature’s garbage collectors, the important ecosystem service offered by dung beetle helps recycle nutrients, reduces parasites, and can even help seeds germinate. While the two tribes studied do not have species that create balls, they instead have evolved many other diverse behaviors. This includes species that do not feed on dung but specialize on fungi, carrion, and dead millipedes. Many species that evolved from the same common ancestor even live in close association with termites and ants, where they might be feeding on nest debris. “This is one of the most important groups of dung beetles that finally has a hypothesis on how they evolved and diversified on earth,” Philips notes. “The evolutionary scenario can now be tested and refined in the future with more data.” Although relatively well known, this group still may have as many as 1,000 undiscovered species left for scientists to document. 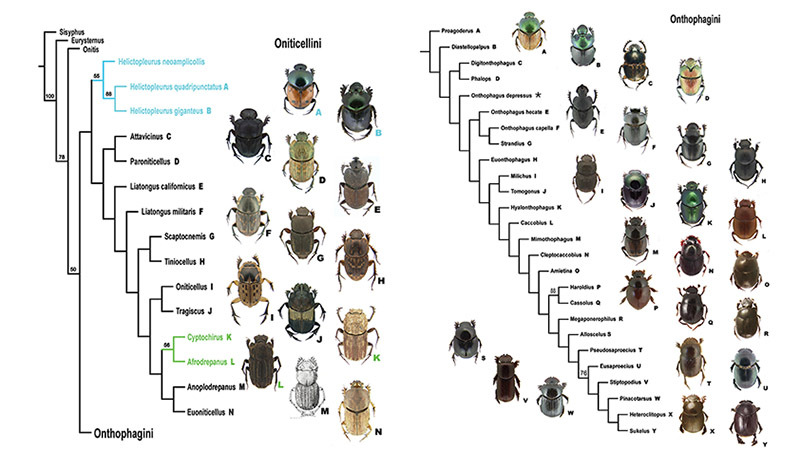 Philips TK (2016) Phylogeny of the Oniticellini and Onthophagini dung beetles (Scarabaeidae, Scarabaeinae) from morphological evidence. ZooKeys 579: 9-57. doi: 10.3897/zookeys.579.6183.